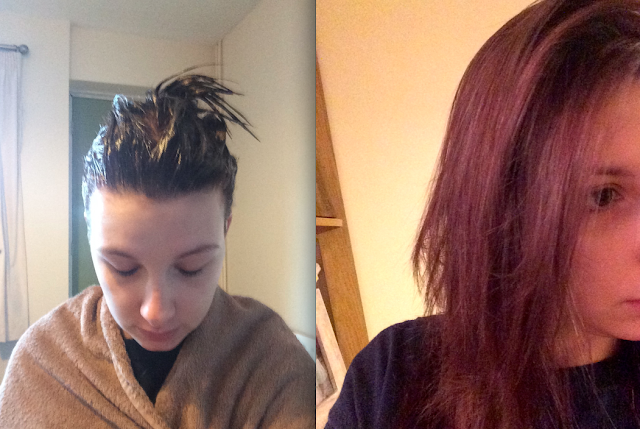 So today I had that spur of a moment feeling to dye my hair. I had been umm-ing and ahh-ing it for a a while now, whether to put the ombre back into it, go darker or maybe go lighter, but in the end I just gave up as I really could not decide or be bothered to go buy some. But over coffee today with my sister we had a short discussion on whether I should cut my hair shorter as I am a little bored of it or for a cheap option change the colour of it, within 10 minutes we had gone from Costa to queuing up in Boots with a box of dye in my hand. 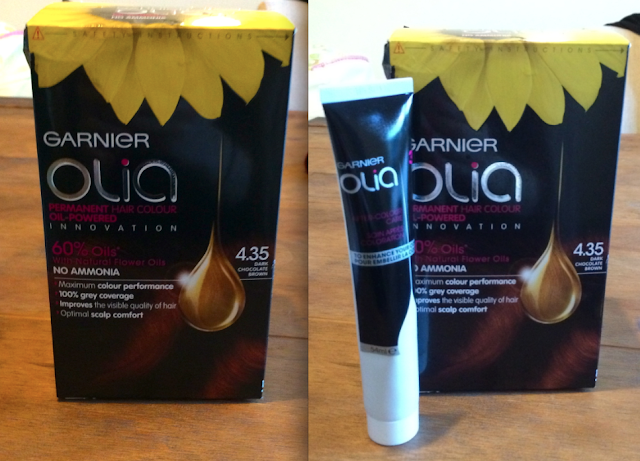 I bought the Garnier Olia- permanent hair colour in 4.35 Dark Chocolate Brown; it is a rich brown colour with a warm red tone to it. My natural hair colour is quite a dull, medium brown with little bits of blonde on the end from when I did it ombre over the summer. The dye is oil powered with no amonia, it has no difference in the way you put it in your hair, however I do feel my hair is fresher, healthier and more shiny. The best thing about this dye is that there is no smell to it, normally you get a very powerful, potent small which leaves you gasping for air, but with Garnier Olia it is smell free.